Play Mustang Gold Slot Online with 500 Free Spins! Mustang Gold is a 5 reels, 25 paylines online slot game by Pragmatic Play. 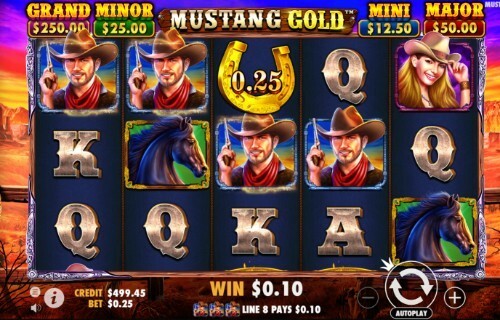 Mustang Gold has Wild, Scatter symbols, Bonus Game, Free Spins, and Multiplier features and an RTP of 96.53%. The best place for you to play Mustang Gold is here at Rose Slots, which is also home to over 500 great UK online slots including Fluffy Favourites, Starburst, Rainbow Riches and Great Rhino. The highly-respected Pragmatic Play studio kicked off 2019 by releasing Mustang Gold into the world, and they couldn’t have chosen a better option to start the year with. Thematically and visually it’s a case of ‘more of the same’ from the studio which won several awards in 2018 for Wolf Gold. Although Mustang Gold isn’t a direct sequel to that release, there’s no denying that there are striking similarities between the two online slot games. Both of them use the American Old West as a backdrop, and they both touch on the ‘animals and nature’ genre, too. Mustang Gold could be considered to be on the other side of the fence to Wolf Gold, though. Wolf Gold was all about Native American culture. In Mustang Gold, we’re riding with the cowboys! Mustang Gold contains far more than meets the eye. It initially appears to be quite a simple and traditional slot - the graphics are charming without being overly impressive, and the 5x3 layout is the standard for online slots. Twenty-five paylines isn't out of the ordinary either - in fact, by modern standards, you could even consider that to be low. Above the reels, though, you'll notice a real-time tracker is informing you of the current jackpot values, and that's the first place Mustang Gold marks itself out as being more than your average slot game - it's connected to a progressive jackpot. That can trigger without warning on any spin and could yield a payout of anything between £125 and £2,500. Focusing on the base game to begin with though, everything happens on a country-style wooden frame which almost completely fills the playing area. Reddish-orange hills roll away into the background, and a backing track of country music and animal noises tells you that we're probably in America's Deep South. We're guessing someone within Pragmatic Play's design team is a big fan of the old Western movies. All we're missing is Clint Eastwood's face on the reels! The symbols on the reels are a fairly standard affair when it comes to the low values; they’re represented by playing cards J through A, and they’ve been given a thematic tweak so they appear consistent with the theme. You’ll be more interested in the most valuable symbols Mustang Gold has to offer, which are a pair of horses (one white, one black), a cowgirl and a cowboy. As we mentioned in passing at the start of the review, the slot also has a wild symbol. That takes the form of the Mustang Gold logo, and can only appear on reels two, three, four, and five. It will take the place of any other basic game symbol to create a paying line for you when it appears. There are a few symbols which the wild won't substitute for, and that's because they serve a higher purpose. There's a scatter to look out for first of all, which comes in the shape of a campfire. You'll only find it on the middle three reels, where it can trigger one of the bonus features if all three of them turn up at once. Beyond that there are two special bonus symbols; horseshoes which display cash values, and a ‘Collect’ symbol which looks like a sheriff’s badge. To understand more about how those work, we need to talk about the slot’s bonus features. Pragmatic Play’s visual design style is so distinctive that once you’ve played a couple of their online slots, you’ll recognize the rest of their range on sight. The company, founded back in 2007 in Malta, are at the start of their second decade making online slots. If it’s anything like their first, they’re going to be one of the most celebrated slot game developers in history by the end of it. They'll also be one of the most prolific. There are already over 100 Pragmatic Play slots out there, with at least one new one coming out every month of the year. Not all of them have been runaway successes, but when they're good, they're very, very good. So good, in fact, that Wolf Gold walked away with ‘Slot Game of the Year' awards from two different awards ceremonies. Can Mustang Gold do the same for 2019? It has to be considered a contender! There are two bonus features in Mustang Gold aside from the progressive jackpot - although one of them can shortcut you into playing for the progressive jackpot if you strike lucky. First up is the Free Spins feature, which you need to land a trio of scatter symbols to trigger. There are only three scatters on the reels, so eight free spins are the maximum you can receive when they appear on your reels. You can, however, trigger the feature again if the scatters re-appear while the free spins are in progress. Some other online slot games by Pragmatic Play will apply multipliers to winnings found during free spins. Mustang Gold doesn't do that, but it will reward you in other ways. More horseshoes and ‘collect' symbols appear on the reels during your free spins, and they play right into the hands of the slot's other bonus. That bonus is called Money Collect, and although you can win money with it during the base game, it’s a lot more likely to happen during the free spins because of the additional symbols on the reels. This is all about those horseshoes and sheriff badges. To get a payout from money collect, you need at least one of the horseshoe symbols on one of the first four reels, and the ‘collect’ symbol on the fifth. If that happens, you’ll win whatever cash value is printed on the horseshoes. If you can find two or three horseshoes plus the sheriff’s badge at once, that usually results in a high-value prize. Sometimes, though, the horseshoes may not have a cash value on them at all. They might just say ‘JACKPOT’ instead. If you find a ‘JACKPOT’ horseshoe and the sheriff’s badge at the same time, you’ll be taken straight to the Progressive Jackpot screen to play for big money. In this screen, you'll be asked to make selections from a grid of horseshoes, picking them off one at a time until you find two of a kind. Your matching pair will be either the low, medium or high jackpot, and you'll instantly receive the corresponding payout when it happens. Mustang Gold is a highly playable and atmospheric slot which is a lot of fun and allows you a fair chance of playing for its most valuable prizes. Obviously, not everyone will qualify for a shot at the progressive jackpot, but the way it's connected to the base game makes it feel like it's more ‘in reach' here than it is in many other online slot games which are hooked up to one.